I love the Fremantle working port at any hour of the day and took this photo just before sunset yesterday, after I had taken some photos of the Foodtrucks Under the Bridge event at the East Street jetty. I love the visual impact of all the cranes pulled together by the 200mm lens I used for the photo. I added the golden oldie I took some time ago, as it is heating up this week. Summer is coming! Next week the canopy will be put on top of the posts in front of the Passenger Terminal to improve the arrival for the thousands of cruise ship passengers who will visit Fremantle this summer season, so stay tuned for photos of that. 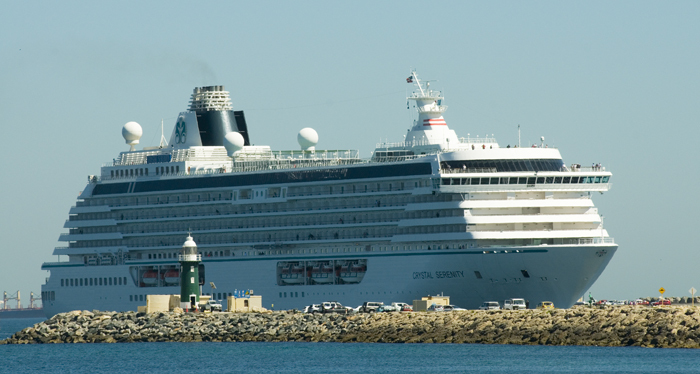 Fremantle’s Victoria Quay Passenger Terminal was a beehive of pensioners this morning with two cruise ships in town. The Costa Deliziosa and Pacific Jewel were anchored bow to stern and a stream of passengers alighted. Busses and taxis were queueing up to transport the mainly elderly holiday makers to their destinations around town or take them on sightseeing trips to the Swan Valley, Pinnacles and Perth. I got away with what I believe is a really nice series of ‘street photo’ observations of the activity at Fremantle Ports. The cruise liner Crystal Serenity arrived in Fremantle today and what an impressive sight it was to see it floating by the South Mole lighthouse. Fremantle is the top tourism destination in Western Australia by a long shot and ahead of second spot Margaret River. Fifty cruise ships will visit Freo this season, so if you see any people with money belts, silly hats and loud shirts you know a cruise ship has arrived. Say G’day, give them a smile and point them in the right direction when they look a bit lost.